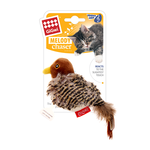 Gigwi Melody Chaser toys use realistic animal sound effects to capture your cats attention and encourage them to play. Playtime is important to keep your cat mentally stimulated and physically active, helping to prevent boredom and weight gain. 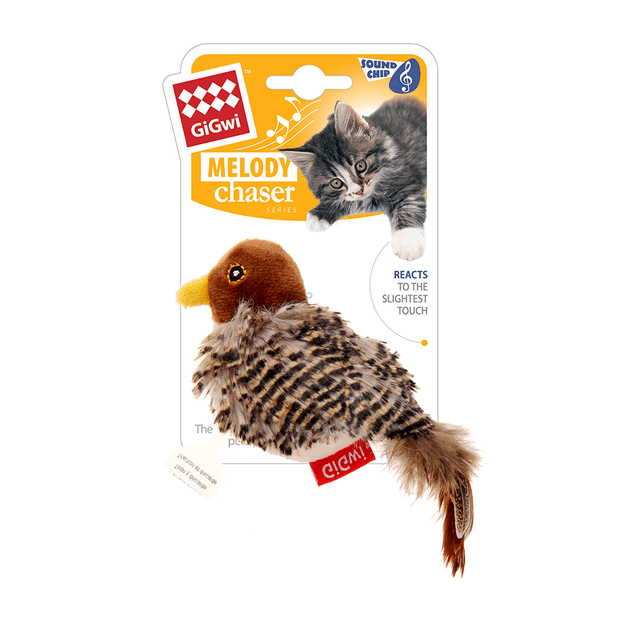 With a motion activated sound chip that plays bird sounds at the slightest touch and realistic downy feathers, the Gigwi Melody Chaser Bird will unleash your cats inner hunter for hours of fun. Looking for an interactive cat toy that moves as well as playing sound effects? Try the Gigwi Pet Droid Feather Hider. Is your cat a catnip fiend? Check out our range of Gigwi Catnip toys for cats. My kitten is obsessed with this bird. Constantly playing fetch with it. We have to to take it away from her at night because it makes too much noise but she's so happy to get it back in the morning. It distracts my cat for a little bit. My cat is obsessed with this toy. I've never seen him so territorial over anything like this. He hasn't put it down. My 1 year old cat loves this toy, as soon as it arrived I threw it in his direction and he chased it around then trotted off with his "kill" to his favourite spot in the garden and rolled around on it and chewed it, bird is covered in dirt, lol. He loses interest after half an hour so I hide it and give it to him again late at night to stop him hunting outside, this keeps him entertained until bedtime. We have had quite a few laughs watching him playing with this and the chirping noise isn't loud and annoying like some toys. Birdy lost its tail this week due to my cat chewing it off.